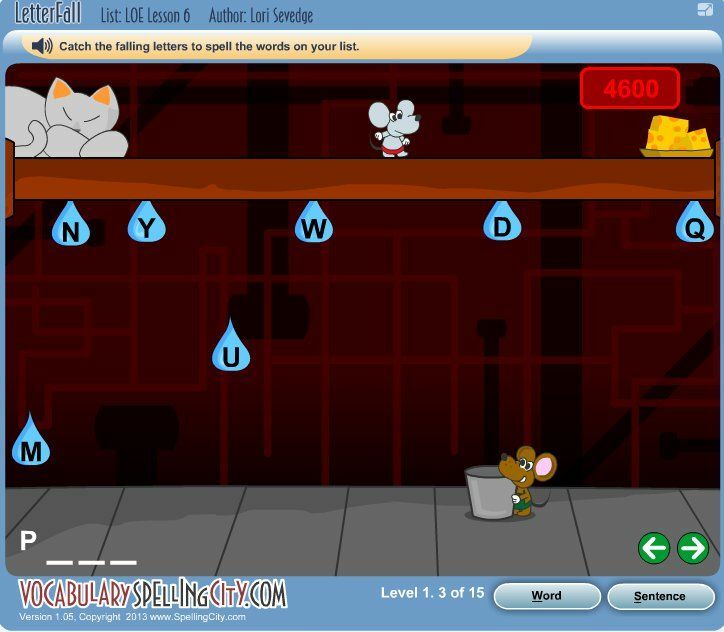 VocabularySpellingCity is an interactive on-line spelling and vocabulary program for grades k-12. We reviewed the VocabularySpellingCity Premium Membership which allows you to register up to 5 students from grades K through 12. It is web based so you are able to access the site from any web enabled computer or even multiple computers all at the same time. They now have an app as well. This is a program that comes up for discussion in my homeschool groups often. I see it discussed in Facebook groups and online discussion forums regularly. Everyone always wants to know if the Premium Membership is worth the price. When the opportunity to review it came up I jumped at the chance! It seemed to perfect opportunity to be able share with everyone exactly what is offered. Our family used it with my Noah (7) and Ezra (5). What makes this program run are the word lists. There are several built into the program based on common themes like holidays or geography, or you can make your own. That is what I chose to do. Throughout the week I kept a scrap piece of paper handy and whenever I noticed one of my boys struggling to spell a word I would write it down. Then I’d sit down and make up an individual list just for that child. For the following week they would use that list of words within the program to take different kinds of practice tests designed to help them learn the spelling and definitions of the words in their list, they played all kinds of games that reinforced the desired skills. Their favorite game by far was one pictured below called letter fall. They had to move the mouse back and forth across the screen catching letters that spelled the current word. If they caught the right letter they gained points. If they caught the wrong letter they lost points. The speed and difficulty increases as the game progresses. Other favorite games include the crossword puzzle. Both of my boys definitely enjoyed the mental challenge presented here. It was their first introduction to this sort of thing and to my own personally delight they love these! Since I can create the word lists there is literally no end to possibilities here. They will forever be as easy or difficult as I choose for them. I appreciate that many of the games not only worked on the spelling but also the vocabulary. I included words from our read alouds that boys were unfamiliar with further developing their language skills. Other games are more straight forward spelling. Here the object is speed. Typing skill can get in the way, but over all I like to see clean games that just involve testing of the skill we are looking for. The game that elicited the most giggles would have to be HangMouse. Played like your traditional HangMan game, the mouse swiped by the cat if too many mistakes are made. Quite humorous for little boys. Some of the biggest challenges I faced with this was making the time and forcing myself to go in and enter the word lists each week. While this is the absolute beauty of the program, it is so customizable, it takes discipline and routine as a homeschool mom to make it happen. It took quite a bit of my own time learning to use the program. I consider myself to pretty pretty savvy with your average websites and yet I found it a challenge to figure out how to navigate around the Parent Toolbox. I found it challenging to figure out how to create students in order to keep track of their progress. Even after creating the students I couldn’t figure out where their information was being tracked. There are videos and other tutorials that I carefully watched and they were helpful yet I still had difficulty. It just isn’t an intuitive set up. But once I was finally setup it was certainly worth the time and effort. VocabularySpellingCity does offer a portion of the website free of charge their premium membership allows you to access record keeping, progress tracking, student log-in, extra games and activities and a wealth of resources. The cost of the premium membership for up to 5 children is only $29.99 for an entire year. You get a tremendous amount for that little price. This is a resource we will certainly continue to use for the rest of the year and I will likely renew it in the future. For all of those that are always questioning if the premium upgrade is worth it I will tell that it certainly is. Your children’s spelling and vocabulary will certainly improve with consistent use.